The lowlight was that crossing of random Roman numeral DXC with C-TEAMS, which my sports-fan husband has blown the whistle on. Gotta call a penalty on this one. 11a. [Cold response? ], BRR. Yes, please. The heat index this weekend in Chicago is about 110°. 53a. [Sites of many -ectomies, for short], ORS. I think my only -ectomy was that tonsillectomy. Here’s a poem called “Radical Man-ectomy” you might enjoy. 41d. [Fitting pastime? ], JIGSAW. Jigsaws are so zen. I do like them for zoning out and not thinking about stressful things. If you’ve got some money to spend and love jigsaw puzzles, check out the wooden puzzles at Liberty Puzzles. Dang it, I got distracted and just wandered away from this post to order another jigsaw. I hold Andy responsible. 9d. [Emperor who called the First Council of Nicaea], CONSTANTINE. We would also have accepted a Keanu Reeves clue here. 4.25 stars from me. Here’s the Constantine trailer—it gives away a lot of the movie, though. 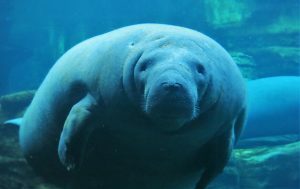 Fill note: I thought [86a: Denizen of Florida’s Crystal River] would be OCALAN or something crosswordese-y, but I was pleasantly surprised to find a MANATEE. Is this just a constructor I don’t know or a pseudonym for someone? Seriously, I am asking, because if this IS a new name to this blog, this is quite a debut. I don’t solve every LAT puzzle, so perhaps there have been others by him. I think I have begun to take for granted the fact that I know, through various outlets, most every byline I see these days. It’s like when someone shows up at the ACPT for the first time and finishes in the top 20 and everybody is like “Who is this? ?” But realistically, I, in fact, do NOT know everyone, but Brian, nice to meet you! 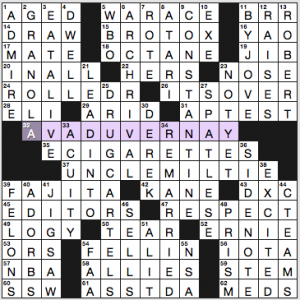 This was a solid 72-word grid. I found the fill clean, perhaps explaining the fast solving time. Perhaps the World Cup has me in a good mood! 4.5 stars this morning. 20A [“I Miss You” (1994) R&B singer] AARON HALL – This is the one-time lead singer of Guy, the R&B group formed by Teddy Riley before he started a zillion others, including Blackstreet. My main surprise here? This song is almost 25 years old!! 50A [Small ’90s-’00s Nissan] ALMERA – According to Wikipedia, this car was sold in Europe, which is why I’ve never heard of it! Thank goodness the crosses are all gimmes! 57A [“Politically Incorrect” host] MAHER – I usually watch this. I am not as partisan as he is, but I do find it entertaining. He has a new HBO special debuting in July. 2D [Johnson & Johnson brand] AVEENO – Between them and P&G, that covers most products, right? 3D [Wayans family member] KEENEN – Keenen Ivory Wayans is now 60 years old. Man time flies, and yes, I know I am sounding old today! 7D [“Rack City” rapper] TYGA – Before he hit is big, he actually had a concert in Elkhart, IN, a few years back. He may never be as crossword famous as ICE-T or NAS, but he does have a unique name! 10D [President after Anwar] HOSNI – Anwar Sadat signed the Camp David Accords in the late 70s, which is one of the first current events I can remember reading about. I was 8 or 9 at the time. 33D [Lighting event?] A-HA MOMENT – Best entry in the grid! 54D [“Law and Order: CI” actress Kathryn] ERBE – Like TYGA, she also has a unique spelling, and she is also slowly gaining crossword stardom. Time to watch more soccer! I finally broke 10 minutes! No, I don’t track my solving times, but this is easily a record time on a Stumper for me, by at least 2-3 minutes. There is not a single difficult term in here, which helps, and my theory of easier Stumpers near holidays is holding true! As a rule, also, “Lester” has slightly easier Stumpers. So that helps. But I will take it! And now I will likely be stupidly overconfident on the very next Stumper on July 7, even if I see a Longo or a Wilber byline! 4.3 stars today. 1A [Word from the German for substitute] ERSATZ – I vividly remember my grandmother teaching me this word when she bought a package of ersatz sausage way back in the 80s. I remember then it wasn’t great, and even now, vegan substitutes of common foods rarely work. I did try the Impossible Burger last week, though, and that actually isn’t bad. 35A [They run more than three hours for seniors] SATS – This seems to be the best clue in the puzzle. I was fooled, but not for long! 51A [“__ Land” (2018 book on particle physics)] ATOM – This is likely a page turner. And yes, I’m being sarcastic. You can buy it here. 67A [“Daughters of Eve” genre] HERSTORY – This may be the best entry. This word is clever wordplay, because the word history has nothing to do with the word “his”. More Amazon shopping for you here! 12D [“Jambalaya” girlfriend] YVONNE – This is a song, right? 59D & 62D [Certain part-time payee] SEMI PRO – Nice tie-in. It’s not as bad when the clues are close, although in the grid the entries are not as close. When these tie-ins span the whole Sunday-size grid, I get annoyed. This entry was posted in Daily Puzzles and tagged Andy Kravis, Brian E. Paquin, Case E. Smith, Lester Ruff, Mike Shenk. Bookmark the permalink. the two crosses at SPATLESE / UNCLEMILTIE and SPATLESE / ERNIE were hard for me (had N for L, and A for E), but managed to solve it by just trying the two reasonable vowels for the second while typing in every letter in the alphabet for the first. Everything was very gettable and enjoyable! For some deranged reason I like clues with roman numerals — I think it’s because I like to think that paying attention in 3rd grade actually did help me down the line! SPATLESE / UNCLEMILTIE was definitely the last square I filled in by guessing, and I had to come here to figure out that it referred to Milton Berle. I know him, but apparently not his constellation of nicknames. 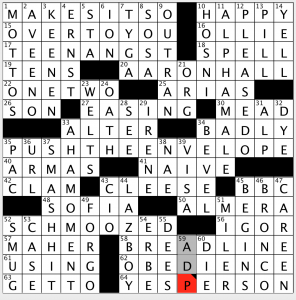 Is it just me, or were both the Stumper and the NYT disappointingly easy today? On the easy side for me but there were a lot of old pop culture references. A Sinatra factoid crossing UNCLE MILTIE, while nearby lurks a mediocre director most famous for a role played by his fourth wife 40 years ago. I Imagine a lot of milllennials would be (justifiably) bemused by all this. Rats. I was hoping that my reasonably decent performance on today’s Stumper means that I’m just that much smarter than I was last week. 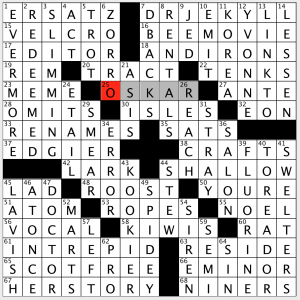 The clue and answer to 25 Down—“Competing groups in Mexico—drug cartels”—was in my view inappropriate and, I must say, offensive; I was shocked to see this in a NYT crossword. So now it has become acceptable to inextricably associate a nation with its criminal element? Using that logic, I offer this clue: “Land of mass shootings” (or “gun fetishists”), with ‘the’ (12 letters).” Is there anyone who would hesitate to fill in the answer? Not sure your example really aligns. Something like “Land of drug cartels,” which is the equivalent to the example given, would be an offensive way to clue Mexico. Likewise, cluing something like Mass Shootings as “Ongoing problem in the USA,” which is the equivalent to what’s in the puzzle, seems appropriate (not that it’s necessarily a great clue). Point taken. But are there not other countries where drug cartels compete for business? A quick Google search suggests there are. It just seems too facile to connect Mexico with drug cartels. I stand by my criticism. I do! I like each of your individual styles and in quite a few cases I can tell who is reviewing, without looking. You make for good reading, each in your own way. I like, also, that I can find out something that I should have noticed when I was doing a puzzle, that might make me like it more (or less). And I have an even greater appreciation for the art of construction. Thanks to all of you for your work on this blog. The company expanded their offerings to include larger and wierder and ‘for kids’, but I was happy with the basic one. I suspect they’re all excellent, but the bigger ones will take up considerable room, not to mention considerable time for the iridescent multi-colored ones. And, yeah, I know how to spell ‘weird’, but there were lots of typos in my comment, and one got missed. Whoa! That’s an incredible feat! Good for you! I loved the original color gamut puzzle. Had no idea there were more riffs on that now! Just ordered the half-tone one with the dots. I had a little Stumper-trouble in the NE, partly caused by having guessed the wrong name for 9D (incorrect last letter). Some portions of the puzzle were right in my wheelhouse, though. That’s probably why I did better than usual. Does it vary in difficulty from week to week? I mean, on purpose? I will do the LAT once I can wrestle the newspaper away from whoever currently has it. The puzzle is in the comics section, so it may be a while. Derek once wrote that Lester Ruff (less rough)/Stan Newman puzzles are less difficult than normal. They all seem to have about the same degree of difficulty otherwise. 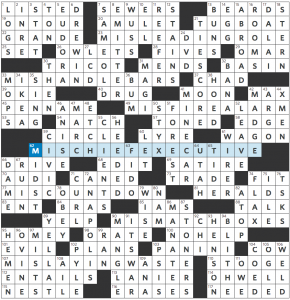 Thanks to Stan and crew for making such a good weekly puzzle! Thanks for the illumination. I look forward to being brain-beaten next week. Amy – have you discovered the online jigsaw puzzles? Granted they might not be quite the same experience as hauling out the card table and laying out a 1000 pieces to pour over. But they are fun, and they don’t take up any room! Totally different experience, not for me. I lived in the Netherlands for years and go back there often. I have never once seen a churro there. But they do have olieballs, which are like donut holes. Some tricky spots in the NYT, but just no way to call Rauschenberg an AbEx. He’ll be in the next chapter entirely in a textbook, with Pop Art, which he inspired while just doing his own influential thing.